Happy Friday! So I've been doing some sketches for my mini album about my son, Jimmy. I played around on the computer a little bit with a few of the pages (sometimes I "think" better on the computer). I decided to go with a basic 4.25" x 5.5" album so I can get 4 "pages" to an 8.5" x 11" page and only have to make 2 cuts. 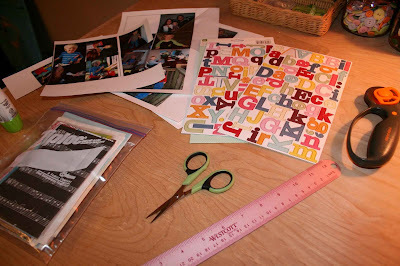 I found some GREAT chipboard alphabet stickers at Target by Making Memories (see pic below) for less than $3.00. 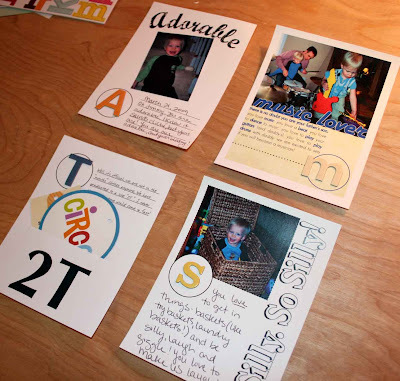 Of course, they aren't absolutely necessary, and the same look can be achieved using handwriting or printing and cutting out letters. However, I have been looking for some basic chipboard letter stickers for quite some time- and wanted to get these to use with this project. I typed a few of the pages, hand wrote on a few, used a font that looked like handwriting on one... not sure how or if this is all tying together and looking consistent. I guess it's good to experiment to see exactly how I want to tie the album together. So, for this weekend: 1. Try making a couple different sketches (in your Idea/Inspiration Journal!! 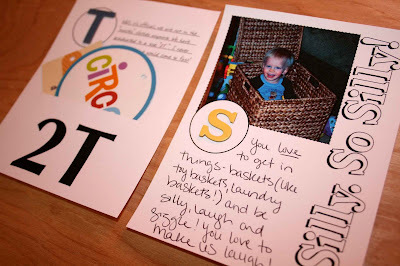 :)) for each letter, put them aside and come back to them later to decide which to use. 2. 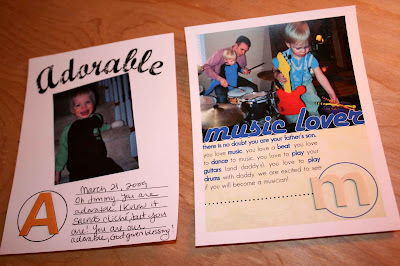 Find pictures (or the momentos you have gathered) for each letter page.